If you own or are thinking of buying an Apple Watch understand that apps are limited for now but the NBA Game Time App is ready to download and use during the first round of the NBA Playoffs all the way through the Finals. The entire 2014-15 schedule can be wirelessly accessed from your wrist. Team and player stats, plus game boxscores and breakdowns are delivered in real-time to the NBA Game Time app along with all breaking news making it a must have for all levels of fans. This is also an international sports tech product because of support for multiple languages such as English, Spanish, German, French, Simplified Chinese , Traditional Chinese, Italian, Japanese, Korean and Portuguese. o Start following a game on your Apple Watch – and get the full experience on your phone with Handoff without missing a beat. The NBA Game Time app on Apple Watch expands a pioneering digital portfolio that also includes a diverse selection of connected devices and platforms including Xbox One, Xbox 360, PlayStation®4, PlayStation®3, PlayStation® Vita, Apple TV, Samsung Smart TV, Amazon Fire TV, Roku and select Sony Blu-Ray players. NBA Digital, the NBA’s extensive cross-platform portfolio of digital assets jointly-managed by the NBA and Turner Sports, includes NBA TV, NBA.com, NBA LEAGUE PASS, NBA LEAGUE PASS Broadband, NBA Mobile, NBADLEAGUE.com and WNBA.com. 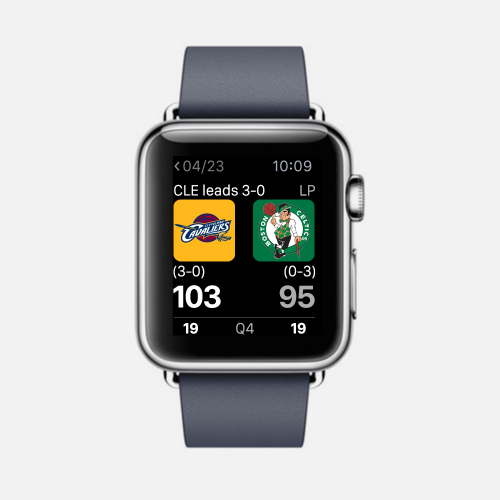 NBA Game Time App Designed For Apple Watch – Sports Techie blog. Sports Techie, I like the Glance feature that allows for a fast view of breaking and trending content as well as the ability to schedule and handoff content between digital devices. The NBA Game Time app is well designed for fans across the nation and world to stay connected with game-by-game details, real-time scores and scheduling information through Glance and Force Touch. The 2015 version is tailored for devices that run iOS (version 6.4) and Android (version 5.05). 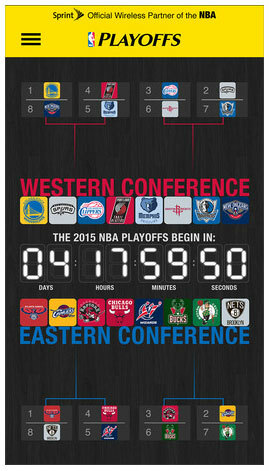 It comes loaded with a live playoff bracket while delivering exclusive coverage of each playoff series. Appreciate each tight game, admire the teamwork by old school teams like the Spurs and Hawks, and get blown away by game-changing individual #newheroball performances by the likes of MVP candidates LeBron James, Stephen Curry and James Harden. Look for advanced coaching analytics and SportVU player tracking all playoffs long. If you can afford it, this is a good time to be an Apple Watch wearing NBA Game Time App using Sports Techie.